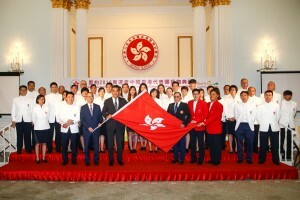 July 11, 2016, Hong Kong: The Flag Presentation Ceremony for the Hong Kong, China Delegation to the Rio 2016 Olympic Games was held at the Government House today. Our Guest of Honour The Honorable C.Y. 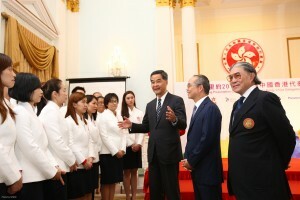 LEUNG, GBM, GBS, JP, Chief Executive of the HKSAR accompanied by Mr. LAU Kong Wah, JP, Secretary for Home Affairs, Home Affairs Bureau in the presence of other distinguished guests from the Government, National Sports Associations and supporting parties presented the HKSAR flag to Mr. Timothy T.T. FOK, GBS, JP, President of the Sports Federation & Olympic Committee of Hong Kong, China (SF&OC), Mr. Ronnie M. C. WONG, JP, Hon. 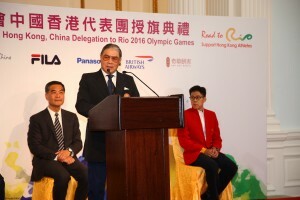 Secretary General of the SF&OC and Mr. Kenneth K. K. FOK, JP, Chef de Mission (CdM) of the Hong Kong, China Delegation to the Rio 2016 Olympic Games. Rio 2016 Olympic Games will be held from 5 August to 21 August 2016. Hong Kong will be sending a delegation of 73 members including 37 athletes, to participate in 8 sports, namely: Aquatics – Swimming, Athletics, Badminton, Cycling, Fencing, Rowing, Sailing -Windsurfing and Table Tennis. Before the conclusion of the Flag Presentation Ceremony, all guests warmly wished the Delegation a great success in the Rio 2016 Olympic Games. The Opening Ceremony will commence, with 25 days to go, on 5 August. Hong Kong, China delegation will start moving into the Olympic Village from 24 July onwards. 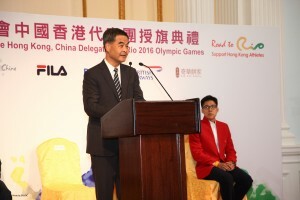 The Team Welcome Ceremony of Hong Kong, China Delegation is scheduled to be held on 4 August at the Olympic Village. Meanwhile, Mr. Kenneth FOK, Chef de Mission of Hong Kong, China Delegation has created a CdM Facebook page where he will share the latest news behind the scene about the Hong Kong, China Delegation. Do “Like” his Facebook page “RioHkgCdm” (www.facebook.com/RioHkgCdm). The Federation take this opportunity to express our heartfelt thanks and appreciation for all the supporting organizations and sponsors, including Home Affairs Bureau, Leisure and Cultural Services Department, Blanc de Chine, British Airways, China Travel Services (HK) Limited, FILA Marketing (Hong Kong) Limited, Kee Wah Bakery Limited, Liberty International Insurance Ltd and Shun Hing Group.